Multiple myeloma is a rare and highly heterogeneous hematologic malignancy, and the clinical research certainly plays a fundamental role in the management of patients with this disease. To deal with such a complex scenario, in 2005, a group of European hematologists pull together to increase their understanding of multiple myeloma and to produce effective research projects and clinical trials. These efforts resulted in the creation of the European Myeloma Network (EMN). According to the recently updated bylaw in 2017, the network board is composed of renowned experts in the hematologic field: Pieter Sonneveld from the Netherlands (Chairman), Mario Boccadoro from Italy (Secretary), Jesus Fernando San Miguel Izquierdo from Spain (Member), Herman Cristoph Einsele from Germany (Member), Meletios Athanasios Dimopoulos from Greece (Member), and Heinz Ludwig from Austria (Member). The board is going to expand in 2019, and newer members from other countries are being included: Philippe Moreau from France (Member), Roman Hajek from Czech Republic (Member), Annette Vangsted from Denmark (Member) and Gordon Cook from the United Kingdom (Member). It all started as a small group of investigators, and today the EMN represents the major European, international association in multiple myeloma and related conditions. 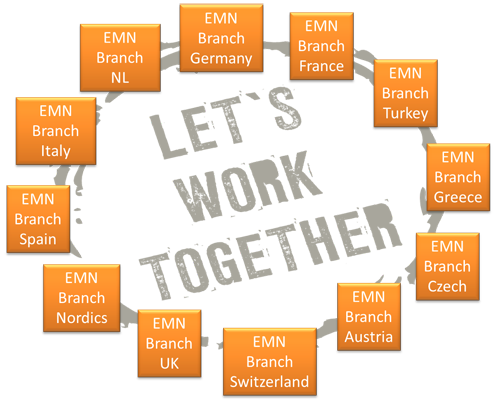 As for its structure, the EMN headquarters are located in Rotterdam and the EMN central office closely collaborates with the data center and Italian branch of the network, namely the EMN Research Italy. Various countries are in fact represented within this big cooperation, and the EMN is a wide platform that can be used by European investigators to start new trials and collaborative initiatives. The EMN is the reference organization for multiple myeloma studies in Europe, bringing advantages to all the actors involved in the clinical research. Indeed, physicians can have the opportunity to participate in cooperative projects to increase and share their experiences, as well as to standardize and harmonize clinical practices at European level; pharmaceutical companies can refer to the EMN as general interlocutor in Europe to plan and manage clinical trials with new effective molecules; finally – and most importantly – patients can be enrolled in clinical studies evaluating last-generation and promising drugs, with the ultimate goal of improving their survival and quality of life. In the last few years, many steps forward have been made in the research on multiple myeloma, and the EMN is proud to have contributed to the development of successful clinical studies in this field. Big objectives can be achieved only through big collaborations, and the EMN is the network that can make innovative myeloma projects come true in Europe. Please find below more detailed information.